The TITAN TV2000 is our efficient and basic twin vertical saw for small to medium diameter logs up to 4m in length. It is designed to break the log into a two-sided cant. It is available with or without log turning functionality. The automated log loader allows for each log to be rotated to an optimal position and then placed onto the moving spiky feed chain. The log is guided by pressure feed rollers, giving it maximum stability in the cut. 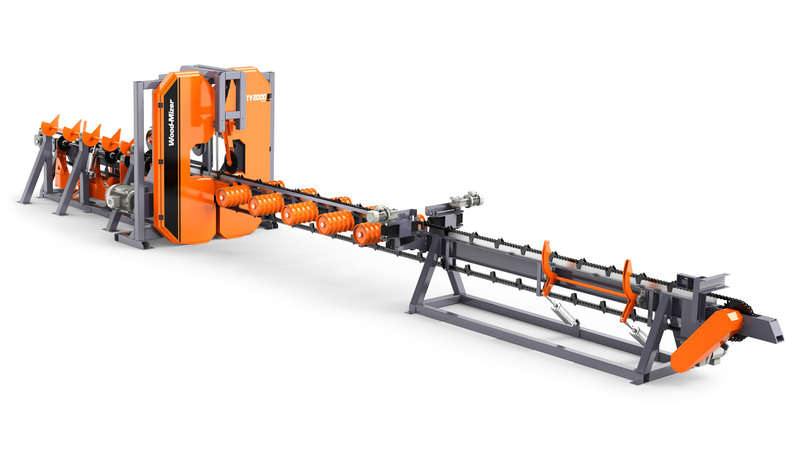 The operator may select the desired cutting size and the machine will automatically adjust to that size, removing the need to sort logs before sawing. Investing in log sorting capability increases log throughput. The TITAN TV2000 is ideal for pallet mill and stud mill operations, where the product has relatively small cross-sectional dimensions.